Things are going quite well for Man City this season, as Pep Guardiola’s side remain on course for a historic quadruple. With the League Cup already secured, the Premier League title, Champions League and FA Cup are still on their list of targets with a crucial month ahead of them. 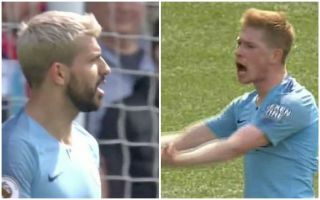 With that in mind, it would be easy to assume that it’s a happy camp at the Etihad, but such are the high standards in the City squad, Kevin de Bruyne still loses his temper now and again with top goalscorer Sergio Aguero. 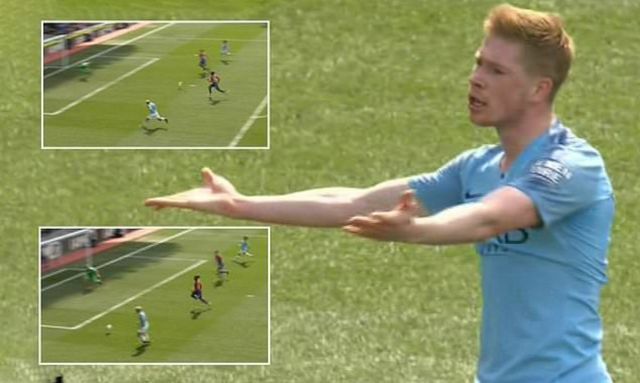 As seen in the photo below, there was a passage of play after Raheem Sterling had given City the lead where De Bruyne delivered a ball into the box, at pace, expecting Aguero to meet it at the back post. In defence of the Belgian international, he arguably had a point. Had Aguero been on his toes and reacted quickly, he could have latched onto it and had a one-on-one situation with the goalkeeper. Instead, he was seemingly caught on his heels and didn’t react quick enough as the pass went out for a goal kick, although it did look as though he still could have got onto the pass if he tried a bit harder. That’s when De Bruyne lost his temper and furiously gestured towards his teammate. Given Aguero’s bagged 29 goals in 40 games so far this season, we think De Bruyne can probably let him off on this one, especially with City going on to secure a 3-1 win to stay on course to defend their league crown.